9 oz. (230 g) baker's bitter chocolate rich in cocoa butter. 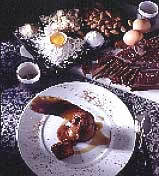 Recommend "Valrhona"
Preparation and cooking: It is necessary to prepare the chocolate core first. Break up the baker's chocolate into small pieces and melt over low flame in double boiler. Mix in the cream, butter and the water and whisk to a smooth consistency.Let sit for about 15 mn. Prepare 6 small molds approximately 1.75" in diameterin freezer. Or you can double the recipe and pour the mixture into a square pan about 1" high and freeze. When firm, cut into 1.5" squares and roll into rounds and press into a 1.75" puck. Replace in freezer to harden. This work must be done meticulously to ensure successfully de-molded biscuits. On a low flame melt the butter. Cut 6 strips of parchment paper 3" x 10".Generously coat the strips with melted butter. Using 6 metal rings 2.25" in diameter and 1.5" high, place the strips into the circles so that the buttered paper overlaps itself on the inside. (The rings can be flat cans with the top and bottoms cut out). Coat the interior of the buttered mold with cocoa powder. You can multiply the proportions 2 to 3 times and the quality of the work will probably improve.The "coulis" stores well. Place the sugar in a pan with a few drops of water and caramelize. When caramelized, thin with the rest of the water. Add the cocoa powder and a small pinch of salt. Bring to a boil for 2 to 3 mns. Whisk until it homogenizes to a smooth "coulis". Set aside and keep cool. Mix the sugar, glucose, corn starch and water in a pan. Bring to a boil to blend the ingredients. Add a handful of fresh mint and let it infuse the mixture to your taste. Strain, cool and set aside. Very carefully de-mold the frozen chocolate cores from step #1 and store in freezer. Break up the baker's chocolate and melt in a double boiler. When melted and warm, add the butter, the powdered almonds and rice flour. Mix thoroughly. Add the egg yolks to the mixture. Whip the egg whites until almost firm. Add a touch of salt. Add the sugar and continue to whip until stiff. Very delicately, fold the whipped egg whites into the chocolate mixture. Arrange the molds complete with paper strips (step #2) onto a cookie sheet covered with parchment paper. Place biscuit mixture into pastry bag equipped with nozzle and fill each mold half way or a tad less. Remove the chocolate cores from the freezer and place one each in the half filled molds. Position the cores in the exact center of the biscuit mixture. Fill the rest of the way and level and smooth top.Place in freezer for 2 to 3 hours. The success of the biscuit depends on centering the frozen cores of the chocolate into the exact middle of the biscuit batter. This is one of the most unusual and delicious chocolate deserts ever to tempt the palate. When you break open the chocolate biscuit, a torrent of rich, hot chocolate sauce pours out. Heaven on earth for the chocoholic. It takes the form of a hot cylindrical, hollow, chocolate biscuit filled with a melted chocolate cream that pours forth when you cut into the biscuit. Michel Bras is one of France's finest chefs despite the fact that he has elected to establish his ultramodern restaurant in his birth town of Laguiole in the region of Aubrac, high in the mountains of the Auvergne in South Western France, miles from any freeways and a dizzying drive from the coast. The simplicity of his dishes would suggest training in Japan but he has only recently visited that country. Instead, he takes his inspiration though not his technique, from his family, regional cooking of his beloved Laguiole.